Known for: Being the greatest week of your entire life. 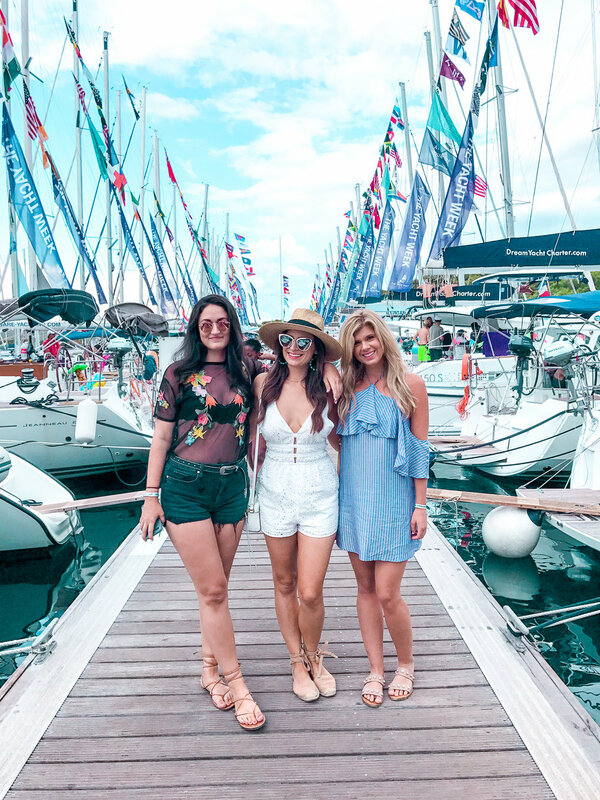 The Yacht Week – What you’ve heard… it’s all true. The Yacht Week boasts epic parties, beautiful people and claims to be the best week of your life. I can confirm, it is. Seems too good to be true, right? A week of sailing around some of the most gorgeous islands in the world with your best friends. Honestly, I felt like I was living a dream and I kinda was. I first heard about The Yacht Week when I was studying abroad in London my Junior year of college. It was definitely a bucket list item and I always said, when I had the money I’d make it happen. Now, it wasn’t easy getting a group of 11 people to commit to an expensive trip abroad for 7 days. There was one point where I didn’t think it was going to happen. But then the party gods were looking out for me and it all came together. We opted for the Original Croatia Route. There’s 7 different routes you can choose from and for the remainder of this post I’m only going to be talking about the original route. It all started back in 2006 when a group of friends from Sweden decided to start their own sailing experience for adventure seekers like themselves. The Yacht Week has grown to include 70,000 people who all love to explore, party and of course sail. Explore, Explore, Explore! I know the yacht week is all about partying and those are epic. But in my opinion, any good trip is all about balance. From the Riviera Chic party to the Seaside Yoga the options on how you can fill your time are endless. But deciding what’s most important to you before you sail is a good idea. For me there were two things I really wanted to do. I wanted to rent a Vespa and drive around one of the islands and I really wanted to see the Blue Caves. 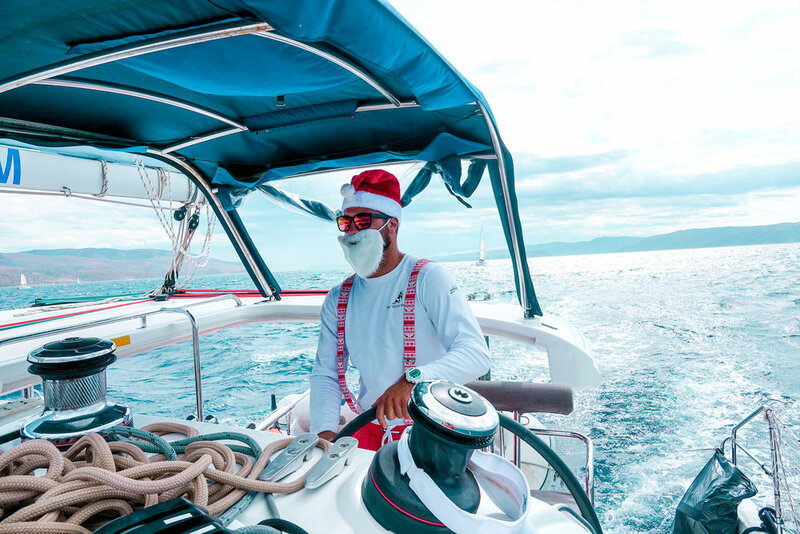 Aside from that it’s best to go with the flow and take your skipper’s advice. Unless your Christopher Columbus, hire a skipper. And unless you want to be cooking hungover in a tiny kitchen, hire a hostess. Truly, they are both equally important and I know for a fact the trip would not have gone as well without them. Shout out to Bozo and Elli! We started calling them mom and dad because they honestly are almost like the cool parents who took care of us and made sure we all made good choices and didn’t slip and fall off the boat lol. CHECK OUT MY 10 REASONS TO GO ON THE YACHT WEEK POST! Morning yoga on Palmizana: Worth it to give your body a reset after all the drinking. Take a boat to the Blue Caves: You have to get up early but it’s soooooo worth it. Rent a Vespa and drive around the island of Vis: Make sure you wear a helmet. I had never driven a scooter before but we all made it back safely and the views were stunning. Walk around the towns: there’s so many cute bakeries and ice cream shops. Don’t forget to actually visit the islands. I know it can be tempting to drink all day and night but I promise there’s plenty of time to do both. Visit the Farmer’s Market in Split: Do an olive oil tasting (sounds weird but it’s delish). The Fort Party is epic. I mean how many people can say they’ve raged in a historic fort? Just be aware of the different levels. I tripped and fell off one, thank goodness for my best friend’s boyfriend who caught me before I belly flopped onto the floor. Thanks Bryan! The Farewell party is a mixed bag. For me, I was so sad it was over I couldn’t get into it. Lol isn’t that funny? But they pull out all the stops and it’s definitely worth it. The Raft Party was pretty insane. The bummer was we were soooo hungover it was a little hard to rage face. My advice, take the night before the raft party easy. The Regatta was epic. It’s always on the last day and it’s a race to see which boat can get back to port the quickest. Each group dresses in theme and it’s a total blast. We didn’t win but I know we had the best costumes. If you hire a hostess she cooks breakfast and lunch pretty much every day. Again, I can’t say this enough. IT’S SO WORTH IT. Your hostess knows exactly how to cook for the number of people on the boat, how to use the kitchen on the boat and keeps the snacks stocked. He or she is your hangover fairy godmother. Literally. It’s hard enough to stay out until 5 a.m., find your way back to the boat and make it to your bed, let alone wake up the next morning and have to worry about cooking for a boat full of hungover party animals. There’s plenty of opportunities to eat out for dinner and enjoy some sweet treats. Here’s my list of all the yummy places we ate while on The Yacht Week. While I’d love it if you took my advice, I’d also recommend asking your skipper and hostess for the best places to eat. They’ve been visiting the islands for the last few months, if not years, and they will know the best spots to get your grub on. Dinner at Hum in Komiza: be warned, if you order the sea bass, it’s huge. But soooo good! Chops Steak & Seafood in Split: it’s kind of American feeling, but it’s really nice and has amazing steak. St Burek: best Burek in Split, our skipper told us this is his favorite place to get Burek which is a traditional Croatian dish. Kind of like a puff pastry with meats and veggies inside. Luka Ice Cream in Split: Damn it was good. Every flavor I tried was delish. 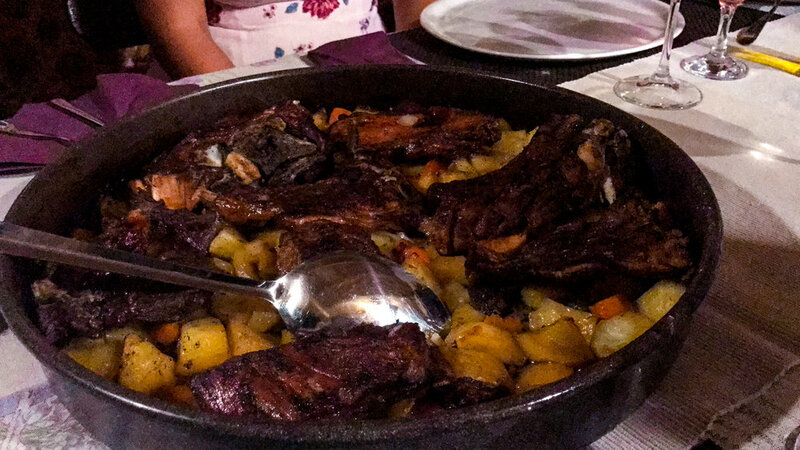 Sign up for the Peka Dinner: it’s a traditional dish in Croatia and it’s fun to eat how the locals eat. It’s usually meat or seafood, slowly cooked under a metal bell, over coals and it’s bomb. Yea you’re going to do a lot of that. Aside from the amazing parties planned each night, there’s some other spots you should check out. Kiva Bar in Hvar: This place is tiny, like I’m talking itty bitty. The first night we went there, no joke, we were packed in like sardines. But it was awesome! This is a favorite among the skippers and hostesses. You have to experience it. Laganini Day Club on Palmizana: This place is honestly the definition of paradise. It overlooks the water and it’s total bliss. Order the St. Clement’s Garden because it comes in a gold pineapple. Hula Hula on Hvar: You’ll for sure go here for a party but I just want to make sure you don’t skip it. Go to a winery on Vis: we did a wine tasting inside a cave and while the wine wasn’t my favorite, the experience was worth it! Be prepared to spend more than you budgeted. It happens. Even though I did my research ahead of time, I wasn’t prepared for the bill that I raked up by the end of the trip. It’s best to just split things evenly with your crew. We used the app Splitwise to keep track of everything and at the end we did a tally. You’re going to need to pay for groceries, port fees which can be around $100 per night, water taxis, bottle service if you choose to partake and group dinners. Your crew is key when it comes to Yacht Week. I think we found the secret sauce when it comes to getting a group that works well together. Our group was a random mix of my high school and college friends. The high school friends had never met the college friends and it honestly was the best combo. The key is to have an open-minded group that’s down for a good time. Bonus: don’t include any meat-heads who can somehow knock back a 24 pack and be ready to do shots. It’s not in anyone’s best interest lol. Really everyone should be responsible, respectful and ready to party. Keep in mind that The Yacht Week puts a large emphasis on the ratio of guys to girls in your group. So boys, you’re going to need to make sure to bring some girls lol. Your skipper and hostess count towards that ratio. 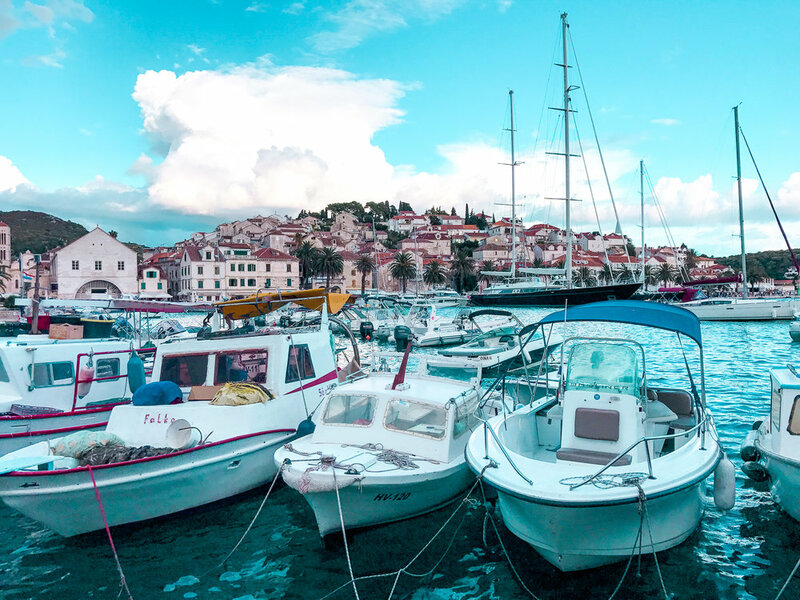 The Yacht Week has relationships with a number of marinas in Croatia and depending on which boat you book determines which marina you leave from. You’ll find out what marina your boat belongs to once you book. While you don’t need to be there to check in until 1 p.m. on Saturday I suggest getting there the day before, if you can. There’s so many moving parts when it comes to international flights that you wouldn’t want to chance having a delayed flight and not getting to your boat on time. Our crew booked apartments at the marina we stayed at in Trogir and it was perfect. Plus, it’s nice to get one last good night of sleep in a comfy bed before you’re cozied up in your mini bed on the yacht. You’ll return back to the marina Friday afternoon and have to check out and get everything off the boat. Truly this part blows. If you’re like me, you hate the end of trips and to add insult to injury, you’re probably going to be the most hungover you’ve ever been in your life lol. But there is a light at the end of the tunnel, the closing night party! Now, you have two options, you can technically sleep on the boat that night but most people don’t. And honestly at that point you’re ready to GTFO and sleep in a real bed and not smell the bathroom. I suggest booking a hotel or Airbnb that night. I hope all of this was helpful and gave you a little insight on what to expect during The Yacht Week. If you want more information I highly recommend checking out their FAQ section on their site!